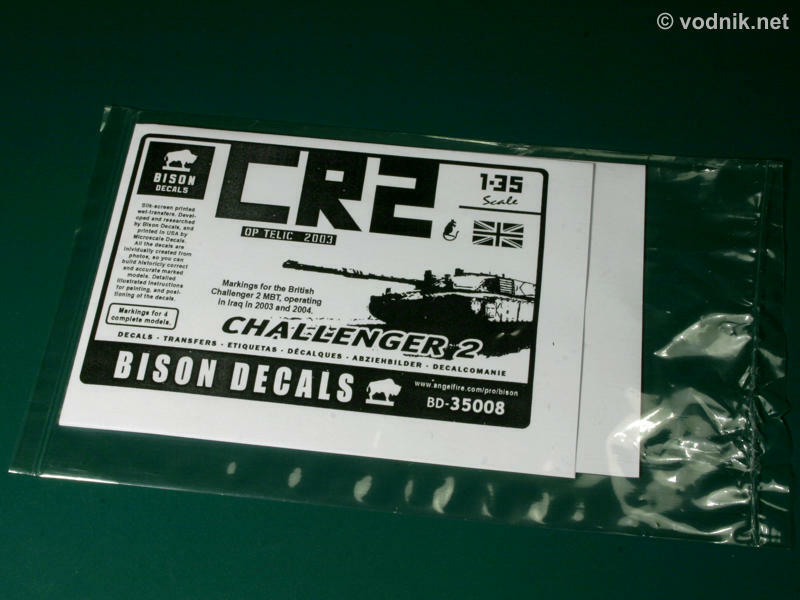 BD-35008 is a second set of decals for British Challenger 2 tanks participating in Operation Telic released by Bison Decals - a company offering mainly small scale (1/72 & 1/76) armor decals, but recently introducing some 1/35 sets to their offer. 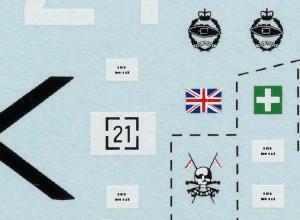 There are markings for four tanks included in the set. The set is packed in a heat sealed plastic bag with a small decal sheet (72 x 130mm) and folded instruction sheet inside. Instructions are printed (or photocopied to be exact) on one side of a single A4 paper sheet and folded in such a way that one quarter of the sheet becomes a "cover" illustration for the set. As no decal numbers are printed on the decal sheet itself, there is a decal placement diagram printed in instructions. Instructions are quite clear regarding the placement of decals and include a list of references (mainly Internet addresses) and a template to make front turret Combat Identification Panels. Decals were printed by Microscale and are up to usual standard offered by this company. There are no color register problems and details are finely printed, although the exhaust shroud warning labels are not legible with text represented by rows of black dots. Decal film is very thin and glossy. As with other Microscale printed decals, also here the use of their Set and Sol decal setting solutions is recommended. All four tanks were painted in overall sand color, but the last tank had "patchy" appearance as if two shades of paint were used on various parts of it. I managed to find photos of all four tanks featured on the decal sheet. Available photos usually show only one side of the tank, so it is likely that Bison had to use some artistic license to add markings for other sides. Markings for options A, C and D seem to be quite accurate and match those visible on photos quite well. The only possible problems are visible in option B. This tank is described as belonging to 2nd Royal Tank Regiment. But close examination of available photos reveals that markings on turret sides are rather Saltires (Scottish flags), not bird heads as Bison proposed in their decal set. Saltires suggest that tank belonged to Royal Scots Dragoon Guard, not 2nd RTR. In any case, the bird (eagle, although it looks more like penguin...) head insignia is also associated with RSDG, not RTR. 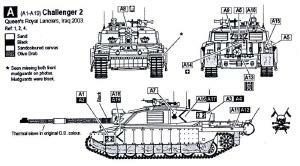 This means that the RTR "Fear Naught" insignia included in the set and meant to be applied to fourth armor block on side skirts might also be a mistake. Reference photo I have of this particular tank indeed shows some dark insignia applied to side skirt in this place, but it is impossible to say what it was. Photos also show that this tank had a small Union Jack attached to the top of TOGS case using black tape and this is not provided on decal sheet. 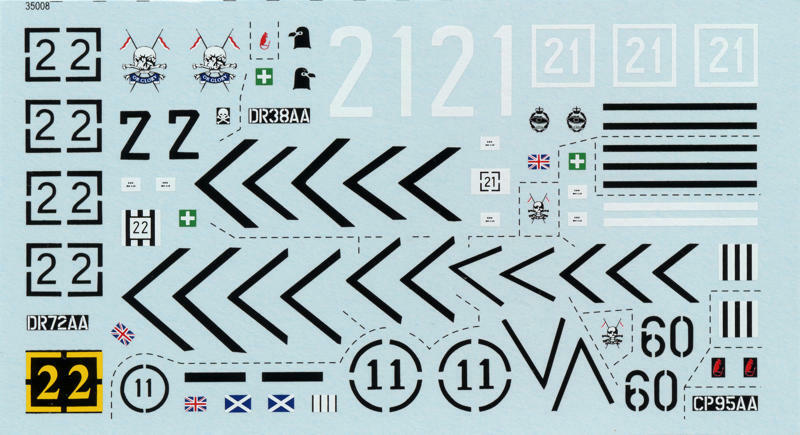 It is worth mentioning that markings for this exact tank are provided in Tamiya Challenger 2 kit and there you get Union Jack for TOGS and Saltires for turret sides. 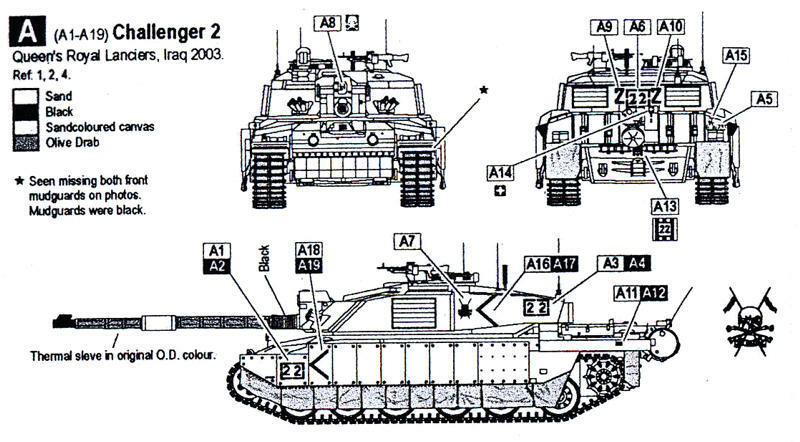 There is no insignia for side skirts however and markings for the rear of the tanks are different. And the tank is described as belonging to Royal Scots Dragoon Guards in Tamiya instructions. By the way, the tank carrying very similar markings, just with white "41" number instead of "21" is featured on another Bison decal set (DB-35007) and that tank is identified in instructions as RSDG vehicle there. 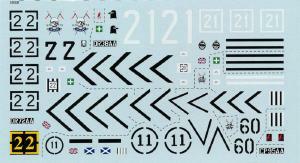 There are some extra markings provided on the decal sheet, which according to instructions should not be used for any of four options. These are three Queen's Royal Lancers insignias and two red jerboas of 7th Armoured Brigade. Nicely printed decals with good color register. 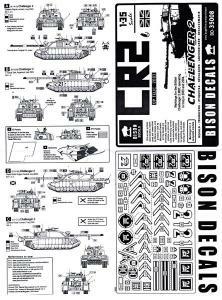 BD-35008 is another interesting offer from Bison Decals. 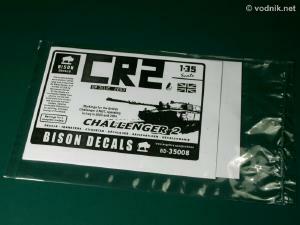 Once again, as in earlier Bison set, owners of Tamiya Challenger 2 kit will find one of the marking options provided redundant, but this time they still get three other options to choose from. Modelers building Trumpeter kit should appreciate those decals even more, as each of four provided options is interesting for them. And if someone wants to use problematic B option, it is always possible to swap eagle head insignias for Saltires provided for option D and omit RTR badges to get markings equivalent to those given in Tamiya kit for this particular tank.